After making Amberjack the other day, I kept on working with the JoeCustoms File Card Creator. This time I made up a cave explorer, rescuer and demolitions expert. Why a cave explorer? 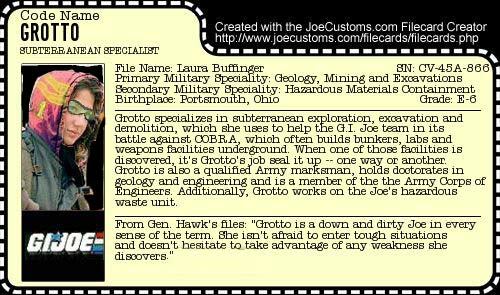 Well, to me Cobra is all about pulp-fiction styled “super science,” and that will eventually mean that the Cobras will be on the hunt for some underground ruin, artifact or element. That means G.I. Joe needs some help. And where Alpine helps them up the mountains, Grotto helps the Joes go under the mountains. Please excuse the awful PhotoShopping I did.